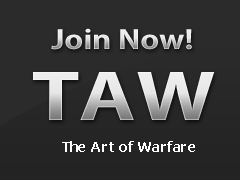 It's great to see you're interested in joining TAW! We have a fairly extensive application system, which ensures that all potential members receive the information they will need and feel welcome here, as well as keeping everything organized. The steps of becoming a member are detailed out below. Our application system is heavily based around e-mails and/or PMs. Please be sure to keep an eye on the inbox of the e-mail you used to apply (and your spam inbox just in case). Add no-reply@taw.net to your contacts just to be sure you get all emails sent to you. This is a pretty self-explanatory step and can be achieved by clicking the "Join now!" graphic in the top right corner of the site. The form will explain the requirements and we ask that you please provide a valid e-mail. You will also need to answer questions specific to the game you are applying to in the comments section. Once you've filled in the application form it will be submitted to the game you applied for and their staff members will review it. Once approved or rejected you will receive an automated email and a private message response. If approved, your acceptance email will include a link to a short audio presentation about TAW with a few basic questions relating to the audio, just to check that you understand what's been explained. Once the introduction is completed you'll be asked to meet with one of our drill instructors in Teamspeak. Your drill instructor will provide you with the Teamspeak information and how to log on. They will do their best to answer any questions you may have and will give you any game specific information you'll need, such as in-game tags required or invites to a group. Once your DI has passed your boot camp, the system will send you another PM explaining how to generate a Teamspeak token, which will allow you to move to any channel you want. (The DI will go over this with you though, just to make sure it works for you.) At this point you are considered a full member and will also be granted access to our member forums, as well as many other features of our website. Add an avatar, signature and Steam link to your profile. Get to know some of our policies. Check out your new division's wiki and member-only forums. Visit TAW on our many social media websites. Check out some of the presentations provided by the TAW University.